An exhibit that shines a light on the value of youth, creativity and the spirit of community collaboration has opened at the Galt Museum & Archives in Lethbridge. 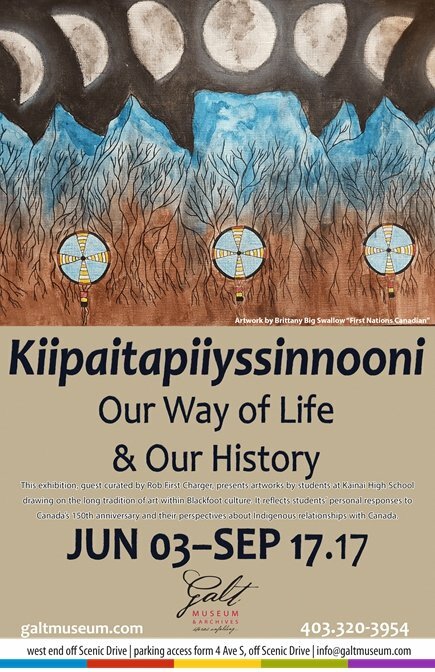 Kiipaitapiiyssinnooni, or “Our Way of Life and Our History”, is guest curated by Rob First Charger and presents artworks by students of Kainai High School drawing on the long tradition of art within Blackfoot culture. For the students, the art work in this exhibition is a reflection of Kainai/Blood identity and culture in the 21st century. The art represents students’ personal responses to Canada’s 150th, and offers perspectives of Indigenous youth, about Indigenous relationships with Canada. “We’re excited to provide a space for young Indigenous voices to be part of the discussion of what this 150th anniversary means from different perspectives,” said Galt curator Aimee Benoit. The exhibit runs until Sept. 17.